Produced especially for the domestic kitchen, in a handy resealable tub (114g) , all made without the use of artificial additives. 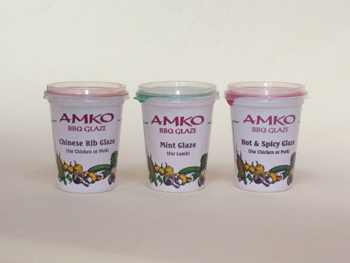 Amko BBQ Glazes are easy to use on Meat, Poultry, Fish or Vegetables prior to cooking. Ideal for the barbeque. With 11 flavours to choose from, only 2 flavours contain wheat. 9 flavours do not contain gluten.